The healthcare debate has brought much discussion about the “Donut Hole”, and what it means for Medicare recipients. Frequently this term is used without further explanation, only noting that it is bad. The “Donut Hole” affects Medicare recipients (typically the retired and the disabled) who utilize expensive medications. It should be noted that the Affordable Care Act (ACA / Obamacare) has scaled in substantial improvements to the “Donut Hole” that are scheduled to be fully implemented by 2020. In short, the "Donut Hole" represents a substantial amount of cash to be outlaid by many individuals who are insured through Medicare Part D. As of this writing (in 2017), the “Donut Hole” begins when the sum total of the amounts paid by the insured AND the insurer for prescription drugs exceeds $3,700. 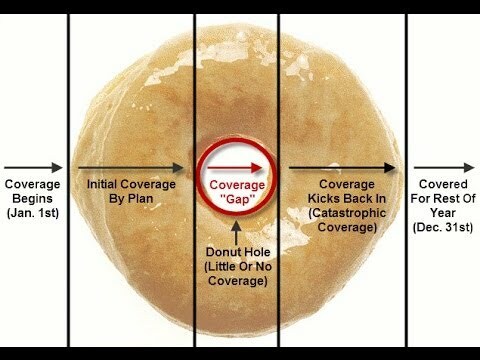 Before the “Donut Hole” begins, an insured’s outlay is typically a predictable deductible or copayment amount, and the balance is borne by their insurer. After total spending by all parties exceeds $3,700, the insured enters the “Donut Hole”, and costs will be substantially increased to the insured party. In 2017 while in the "Donut Hole", Medicare recipients are expected to pay 40% of the cost of brand name drugs and 51% of the cost of generic drugs. To get out of the “Donut Hole”, an insured must spend enough money to qualify for Part D Catastrophic Coverage. In 2017, the amount that the insured is required to pay out of pocket (plus any manufacturer contributions for brand name drugs) must exceed $4,950. Once this threshold is crossed, insurance will cover 95% of drug costs for the remaining portion of the year. The “Donut Hole” is a substantial problem for Medicare recipients who have a regular drug regimen. Especially affected are those recipients on maintenance drugs that have no generic equivalent. Additionally, because most Medicare recipients are on a fixed income, a drug regimen can create substantial hardships even though the recipient is insured. If allowed to stand, the ACA / Obamacare will reduce costs to patients during the “Donut Hole“ by reducing patient responsibility to a maximum of 25% of drug costs during the gap. This will represent a substantial benefit as long as pharmaceutical companies do not raise prices to erode these savings.